One final Friday night fish fry after nearly 80 years in the community. The American Legion Hall in Shorewood is closing its doors for good on it's bar and restaurant. SHOREWOOD,Wis. — One final Friday night fish fry after nearly 80 years in the community. The American Legion Hall in Shorewood is closing its doors for good on it's bar and restaurant. "Its hard, yeah it's very hard," Larry Fox, commander of American Legion North Shore Post 331 said. "We have a lot of things. A lot of memories." "It's been a part of our life," said member Paul McNally. "My mother loves the fish fries. I used to be sent over here to get them before I was a veteran." Fox said they have a membership problem. There are 146 members in Shorewood. But only about 10 are active. "The membership is aging," McNally said. It is a problem for veterans organizations around the country. According to the Patriot Ledger newspaper, the average age of American Legion Members in the U.S. is 67. The VFW's median age is 68. 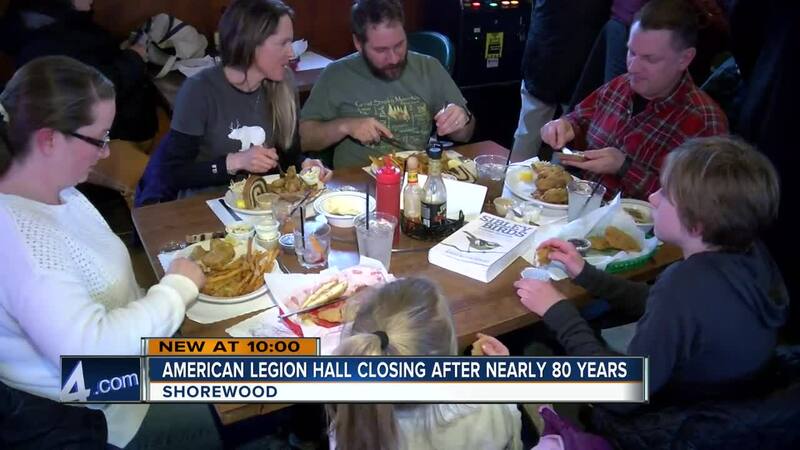 Instead of shutting down, American Legion in Shorewood sold it's building. In a time when an average of 20 veterans a day commit suicide from post traumatic stress disorder, members felt that operating a bar and a restaurant is not a priority. "We could do more by being somewhere else, like by helping them at the VA or something like that," Fox said. They hope this new version of the American Legion might get the younger generation to join up. "We have to refocus and try to focus more on what our mission is in the community and our mission to other veterans," Fox said. The American Legion post shuts down Saturday night. Their meeting will now take place at the War Memorial in Milwaukee.